Today’s recipe is a family favourite. 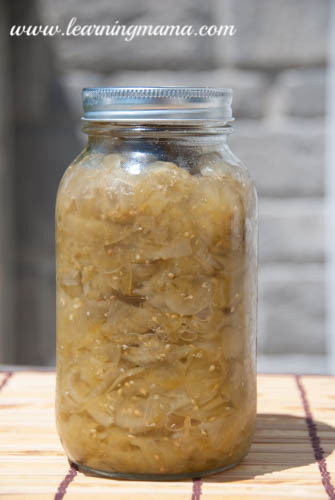 It’s my mother’s recipe for her grandmother’s green tomato chow; she brought the recipe with her to Ontario from Nova Scotia around 80 years ago. I grew up on this stuff – it is especially delicious served on roast beef. I even remember taking a jar with me when I left home, and eating it on my Kraft Dinner! As far as I know, my mother is the only one in the family who still makes it, which is probably why my cousins raid my mother’s pantry when they visit. While I have done some canning myself, I admit that I have never made this particular preserve. My mom does a good job of keeping my supply stocked! Slice tomatoes and onions and layer in a large crock alternating tomatoes, onions, and about 1 TBSP course salt. Continue until done. Let sit overnight or 8 hours. Drain well. Put spice bag in large pot. Add vinegar, sugar , dry mustard, allspice, and cinnamon. Heat to boiling and stir until sugar is dissolved. Add tomatoes and onions. Lower heat and simmer uncovered until tomatoes are tender, between 30-60 minutes. Pack into sterilized jars and seal. Process in water bath for 20 minutes Remove and allow to cool undisturbed. There it is! Our family’s favourite condiment! If you’re on the east coast and this relish is familiar to you, please let me know! I’ve not seen it anywhere else in Ontario and my family is convinced it originated in our eastern roots.